Please choose whether you would like your registration proceeds donated to KC Pet Project, Harvesters or split between the two when registering. We are limited to 50 cars this year at our new location at The Roasterie's Food Truck Brunch. Details on our 9 a.m. meet-up spot will be e-mailed to registrants a week prior to the show. Lunch is available to purchase from food trucks. Prize raffle details coming soon. Registration is per car, not per person. Registrations are NOT transferable or refundable. If you register and find you are unable to attend, please consider your registration a donation to a great local non-profit and let me know so another car can fill the space. Thanks for understanding. Just registered two cars - Richard and I will bring both cars again this year. CathyV wrote: Just registered two cars - Richard and I will bring both cars again this year. 2 cars are signed up!! Woohoo! One MINI, one old guy. Just registered me and Sirius. See you all there. There are TWELVE spots remaining as of this afternoon. One day after registration opened and we are 75% full. If you plan to participate, please register right away. Thanks! Becky and I will be there with Sgt. Pepper along with my daughter and her husband in their 2011 Clubman S. They are new to the MINI community. There are now two spots left. I've created a wait list thread for those who want to show their car and didn't get registered before it sells out, just in case. Thanks! Stickers for those who registered have arrived! You'll find one of these in your registration goodie bag. 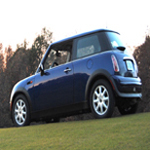 Big thanks to Joanne from Stuck On Minis. She has supported our club for many years, generously donating stickers so all of our proceeds can be donated to KC Pet Project and Harvesters.